If you like the thought of teaching windsurfing on the beach in the sunshine then join Flying Fish and train to become a professional Windsurfing Instructor. Working on the beach as a Windsurfing Instructor gives you much more than just job prospects: you will learn a host of interpersonal skills that are really useful in life, as well as in your role on the beach. There is no better job than being paid to do something you love. As a Windsurfing Instructor you can travel with your work, meeting like-minded people along the way. You are sharing your skills, teaching others and watching them grow. If you are planning to go to university then there is no better summer job to get away from the books for a while and escape to the sunshine. Flying Fish don’t just teach you how to become a Windsurfing Instructor, we start you off on a lifetime of adventure, exploring new cultures and places. With RYA Water Sports centres all over the world who knows where you will end up. Flying Fish have been running Windsurfing Instructor courses for over 20 years. We understand the Water Sports industry and know what is expected of Instructors and have adapted our programmes to suit those needs. 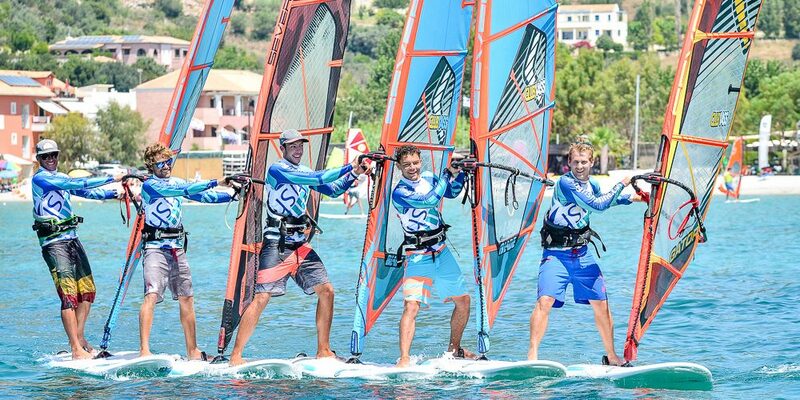 All Flying Fish Windsurfing training courses are based at Club Vass in Vassiliki, Greece. Vassiliki is arguably one of the best high wind resorts in the Mediterranean. You can expect light onshore winds in the morning, perfect for practising skills. Most afternoons the wind turns cross shore, producing incredible planing conditions. The water is warm too, so no need to pack thick wetsuits, only board shorts and a Flying Fish rash vest are needed! With such fantastic conditions customers will improve, quickly, far beyond the level you are required to be at before your final Instructors’ assessment. Another great advantage of choosing to train with Flying Fish is the windsurfing kit you will be learning on. Each year Club Vass buys in brand new sails, boards, paddle boards and mountain bikes. All the equipment is rigged ready to go so you just select your sail and board then off you go. For more information on what’s provided and what we recommend you bring click here. Our Flying Fish Instructors, Adam, Jake and Prim have over 20 years’ training experience collectively. They’re all passionate about sport and love windsurfing. With so much knowledge and experience teaching they won’t just show you how to windsurf, they’ll teach you how to be a great Instructor too. With only 6-8 students on each course, you’ll get the time and dedication from your Instructor to make you the best you can be. Our students come from all over the world from all backgrounds and ages. Students are generally between the ages of 18-55 and often become friends for life. Vassiliki has some awesome off-road guided mountain bike trails that all Flying Fish are welcome to join. We also offer fitness programmes with swimming, yoga or high impact training sessions run three times a week. If that’s not your thing, relax and enjoy the sunshine with an early morning stand up paddleboarding session to explore the beautiful Vassiliki bay. If all that seems too much then you can relax by the pool and just enjoy the sunshine. After 5pm every day you are free to explore the beautiful Vassiliki. Either stay on the water windsurfing until the sun goes down or grab a beer at one of the many beach bars. Club Vass hosts a social evening most nights, from cocktail parties to the famous Club Vass BBQ. You have Saturdays off to explore the island with the other Fish or grab some kit and continue windsurfing. The Windsurf Instructor Fast-track is an intensive four week course, designed for confident, windsurfers who can use a harness in strong winds. The Windsurf Instructor Prep and Assessment is designed for confident, intermediate to advanced windsurfers who hold the RYA First Aid certificate and the RYA Powerboat Level 2 with some experience. This course combines on the water training and theory knowledge to be a competent instructor. Instructor Development is a two-week post-qualification course in Greece, designed for graduates of a Watersports Instructor course or Fast-track with Flying Fish. The Intermediate upgrade is a two-week programme for experienced RYA Start Windsurfing instructors certificate who are looking to improve personal sailing and teaching skills. The one-week Advanced Windsurf Instructor upgrade is designed for qualified Intermediate instructors with experience in the RYA training scheme. We train you in teaching techniques at the top of the sport, with the emphasis on personal coaching and elite performance.